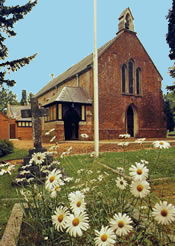 Burley Church is the Parish Church and centre of worship in Burley where Christians of all dominations are welcome. It is dedicated to St John the Baptist and is part of the Deanery of Christchurch within the Diocese of Winchester. We seek to serve the whole community offering friendship and support as well as spiritual guidance, and worship so that all God's people may know of his unconditional love made known in Jesus Christ. The Vicar and trained Lay Pastoral Visitors visit people in their homes and when requested will offer prayer and home communion. Burley Church is here for people of all ages. Activities for children are offered on Sunday mornings during the Parish Communion service and our monthly Family Service is particularly suitable for them. There are always toys available for younger children to enjoy. The Vicar and other members of the Church are also seen in the local school quite frequently supporting the staff and children. Although not a new idea within the Church of England, we now have Café Church as a means of reaching out to our local community. We hold it at 10am whenever there is a fifth Sunday in the month, normally meet in the Village Hall and it lasts about an hour. We share breakfast and there are craft activities both for adults and children. During a short ‘Godspot’, we discuss and reflect upon topical issues. Everyone is welcome to a little bit of Church and a lot of Cafe!